Quickoffice HD adds editing capabilities (for Microsoft Word and Excel) to give you more abilities to draft and update documents. Formatting options include changing font type, color, size, underlining, italics, and bold in Word, and formating cells and using functions in Excel. In addition, the free update includes many performance and multitasking enhancements. It’s good to see a third-party developer and launch partner deliver features that were promised, although it’s likely that most of the software work was completed by the time HP decided to shelve its tablet just 49 days after debuting it. Regardless, there are now many TouchPad owners that can benefit from the new Quickoffice HD functions: Once HP decided to sell off inventory as low as $99 per device, several hundred thousand consumers snapped up the device. Prior to this update — which hasn’t yet appeared on my TouchPad at the time of this writing — I’ve used Google Docs(s goog) directly in the browser to edit Microsoft Word (s msft) documents. The process has worked well, but was sometimes slow or laggy. Once my software is updated, I’ll likely switch over to Quickoffice HD, as the native application should perform better than a web-based editor. The useful software isn’t limited to a specific data source for my document library either. I have it synched up with my DropBox account, Google Docs and the free 50 GB of Box.net storage that came with the TouchPad. The hardware is discontinued, the OS will likely not see any more work from HP, and the editing capabilities are still mediocre compared to MS Works ($30) on a netbook. What about the people that use Publisher/OneNote/Outlook? QuickOffice needs OneNote to be truly versatile, with slate hardware that’s got native handwriting recognition. 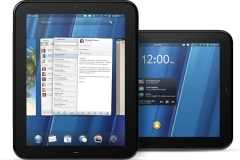 Price that bundle at $399, and now we can talk about slates beating netbooks. Have you found a solution for this on any tablet? Does Pages support proper paragraph styling?